I have a shared tensor used in different epochs, so I need to shared_tensor = tensor(require_grad).detach() , or I have to set loss.background( retain_graph=True ) because of the dependency of the shared_tensor. When I set retain_graph=True, the graph will grow during training. The problem is that the one part in loss is based on the shared _tensor. For example, Loss = loss_a + loss_b, loss_b is from the shared_tensor, but since shared_tensor requires no grad (from tensor.detach() ), loss_b cannot be used to update the network in back propagation, right? How to fix it? 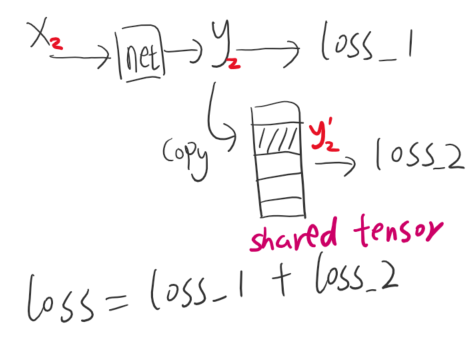 What’s the correct way to save the shared_tensor and calculate related loss? Can you be more precise? what do you refer when you say that the tensor is shared in different epochs?. Thanks for the reply. I just add a figure and code. For example, the figure shows the example of input i=2. If the input is x3, then we get y3 and then y3’. So the tensor [y1’, y2’, y3’…] is used in different epochs. If y2’= y2.clone(), then y2’ also requires grad, so the shared tensor needs grad, if have to set loss.backward(retain_graph=True), or get "trying to backward through the graph a second time, but the buffers have already been freed. ". But if retrain_graph = True, the graph will grow continually to be too big. if y2’= y2.detach(), there’s no the above problem. but loss_2 will not require grad, so network cannot be updated with loss_2. Can I combine loss_1 and loss_2 together, and call backward() once? Or I should loss_1.backward() and loss_2.backward()? I cannot see the figure. The tensor [y1’.y2’…] how do you use it?. Please provide the algorithm or a depiction. calculate loss2 = L1(torch.op(y1’, y2’…)). set y1’.require_grad = False after the 1st epoch, after optimizer.step()? ah okei. Yes, if y1’ is constant in the next epoch just convert it to a tensor that does not require grad, because if not it will try to go under a graph that has been released and will raise error.